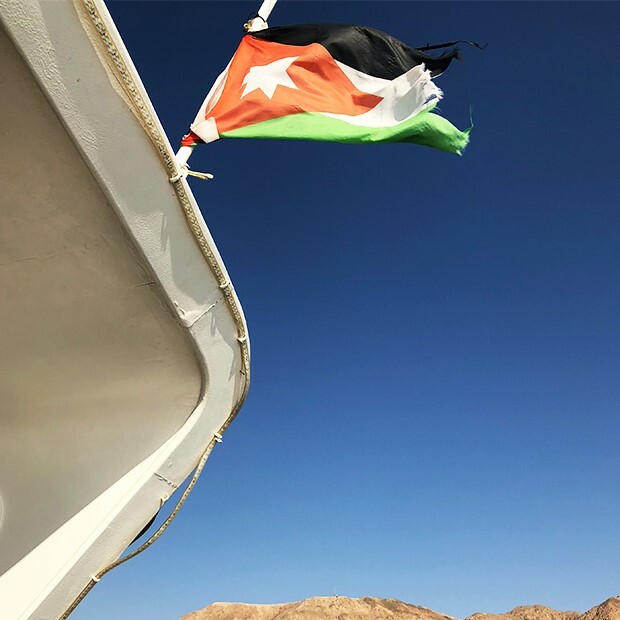 I had the opportunity to experience Jordan with G Adventures and it was a trip I will never forget. 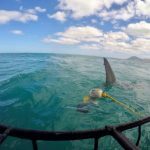 I hadn’t been on a guided trip before, but I thought it would be great to have the extra convenience, knowledge and support of travelling in a group with an expert guide, or “Chief Experience Officer (CEO)” as G Adventures calls them. 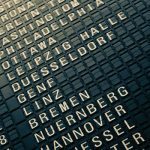 What I experienced completely exceeded my expectations of the benefits of taking an escorted tour. Our CEO, Zuhair, was so knowledgeable and helped us understand the culture and history of the people and places we visited in such a fun way. Having the convenience of travelling in a group with a driver and vehicle made getting around from place to place such a smooth ride (literally!). 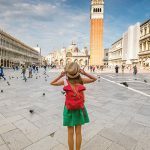 Meeting other travellers from around the world and spending a week making memories together was a great way to see a new country, too. 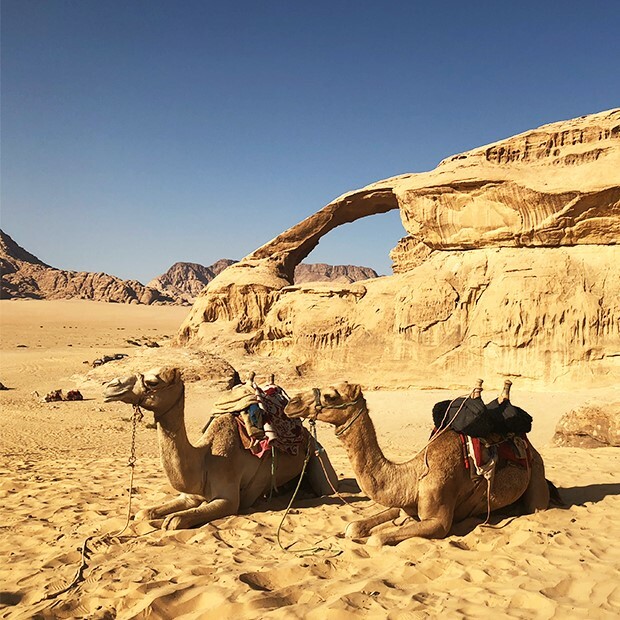 Jordan is a breathtaking destination to visit. The people were friendly, it felt very safe, and the sites were absolutely stunning. 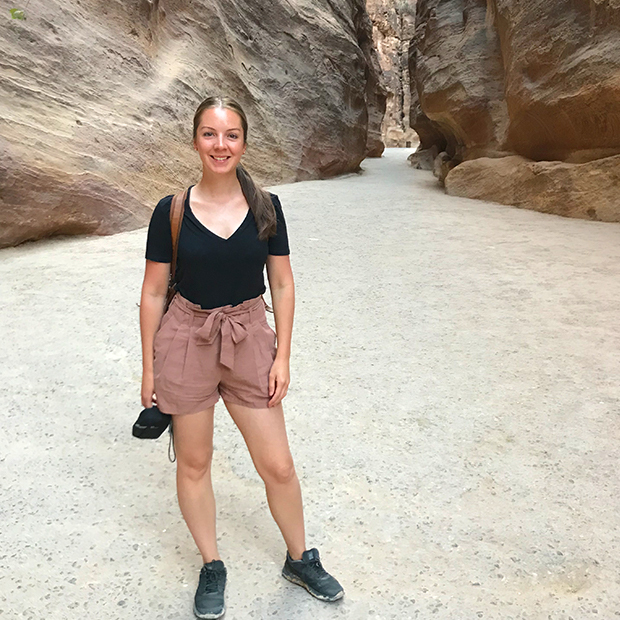 My favourite experiences were sleeping under the stars in the Wadi Rum desert, cruising the sand dunes in a 4×4, and all the hiking at Petra to see the beautiful sites and viewpoints. 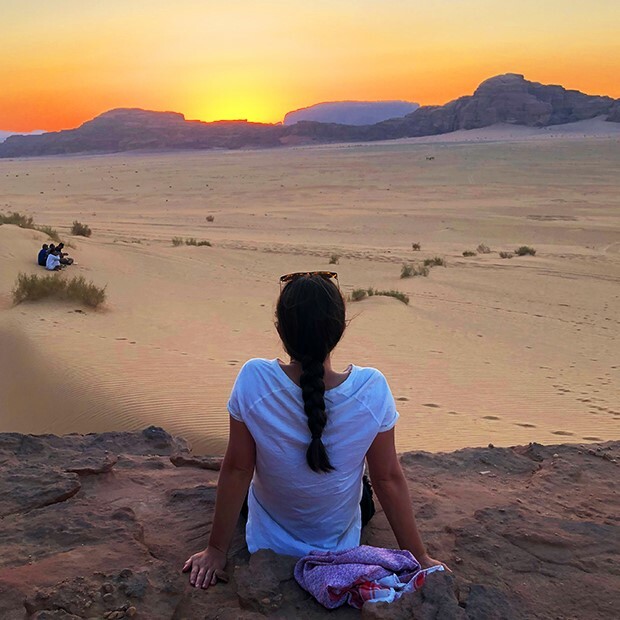 Here are all my highlights from G Adventures’ Highlights of Jordan trip. 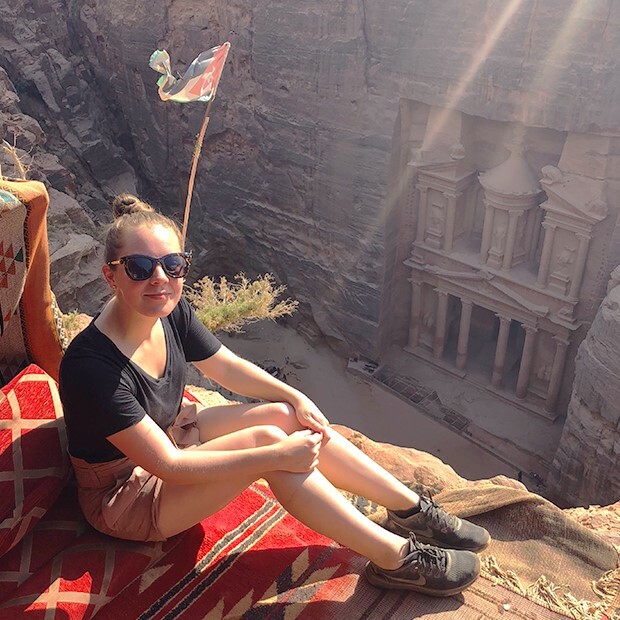 Dubbed ‘rose-red city’ for the brilliant sandstone it was carved from, the stunning city of Petra is a world wonder, one of the planet’s most famous archeological sites, and is Jordan’s most visited tourist attraction. 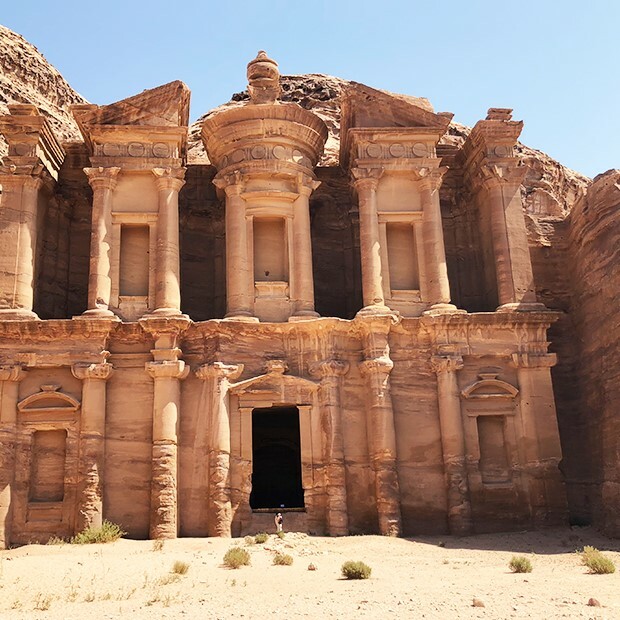 It is unknown when exactly Petra was built but it gained importance as a stop on the spice route and as the capital of the Nabataean Arabs from the 1st century BC. 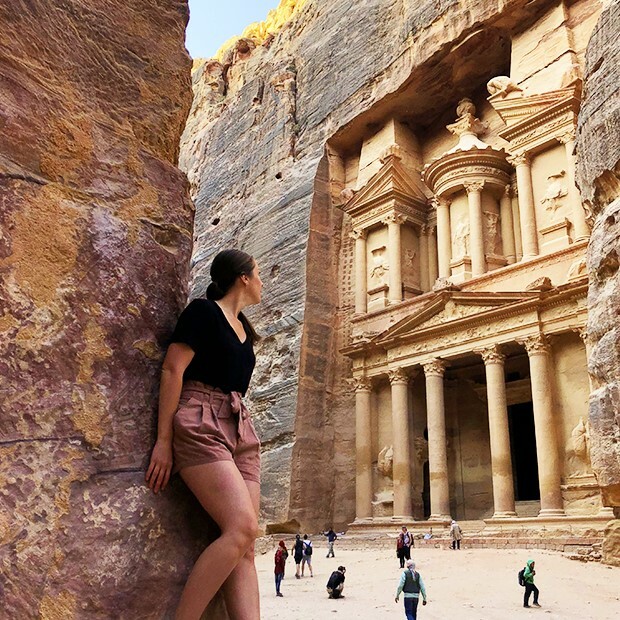 Once under Greek rule, Petra was eventually annexed by the Roman Empire until a devastating earthquake in the 4th century left much of the city in ruins, and by the 7th century, it sat abandoned except for the presence of the local Bedouin population. The Lost City of Petra was finally rediscovered in the early 1800s by a Swiss explorer and has been visited by the world over ever since. In 1985, Petra became a World Heritage Site, and Smithsonian Magazine named it one of the 28 places everyone needs to see in their lifetime. The Siq begins at the ancient Dam and is the main entrance to the city of Petra, ending at the Treasury. It holds evidence of an ancient irrigation system as well as prehistoric rock carvings and ancient sculptures. Narrow rock passageways to the main entrance of the Treasury. 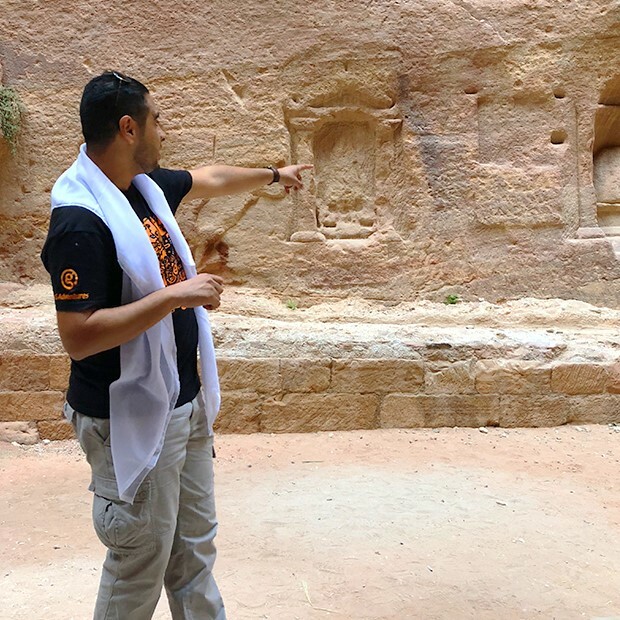 G Adventures guide, Zuhair, explaining Nabataeans rock carvings dating back 2,000 years. Standing in front of the Treasury, photos do not do it justice. It’s hard to believe this was carved out of solid rock thousands of years ago! The Treasury (Al Khazna) is Petra’s most magnificent façade. Standing 130-feet tall, it is decorated with intricate carvings of figures, Corinthian capitals and sweeping friezes believed to be constructed in the 1st century BC. The purpose of the Treasury remains a mystery, with some archaeologists convinced it was a temple, while others think it was a document storage facility. More recent excavations, however, have unearthed a graveyard beneath it. 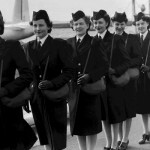 Small-group touring at its best! 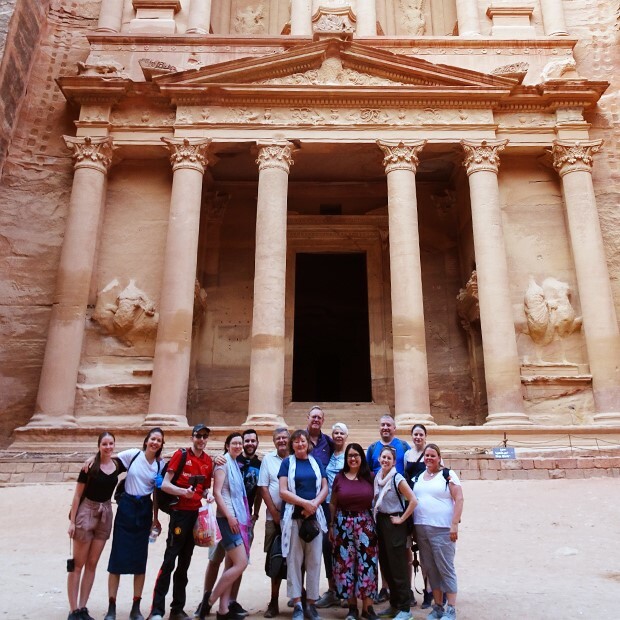 Our G Adventures tour group in front of the Treasury, getting there at the crack of dawn to beat the tourist crowds – a spectacular treat. After the Treasury, we were off to the Monastery. The trek is a steep, one hour hike up steps but well worth the stunning views along the way and the great little café stop to enjoy a snack and some tea was a nice touch, too. A separate hike from the Monastery leads you to a viewpoint directly above the Treasury for unobstructed bird’s-eye views. 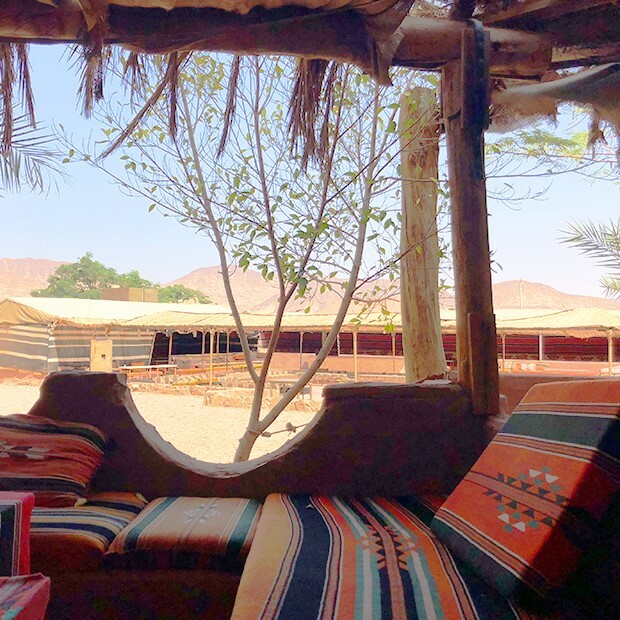 A Bedouin tent nearby offers water and tea to help you enjoy the vista. 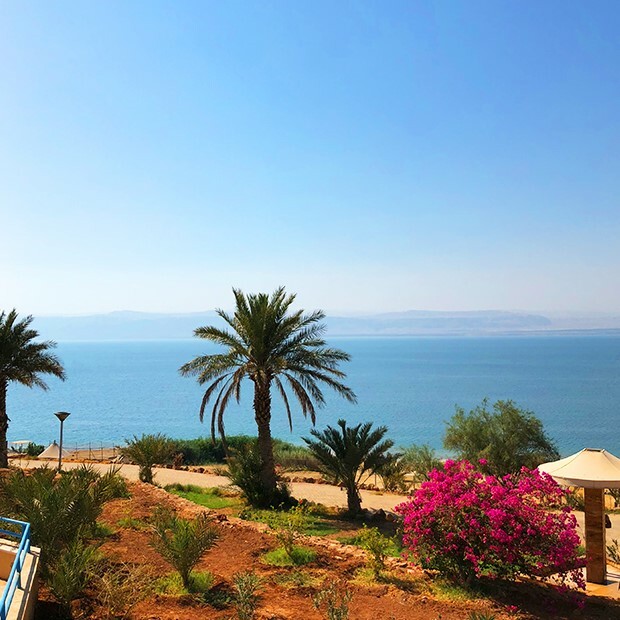 As its name denotes, there is no life beneath the surface of the Dead Sea, and sadly, the sea itself is dying, shrinking at a rate of over 3 feet per year. 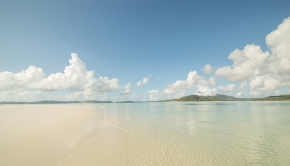 By 2050, some experts predict it won’t be more than a small salty pool. 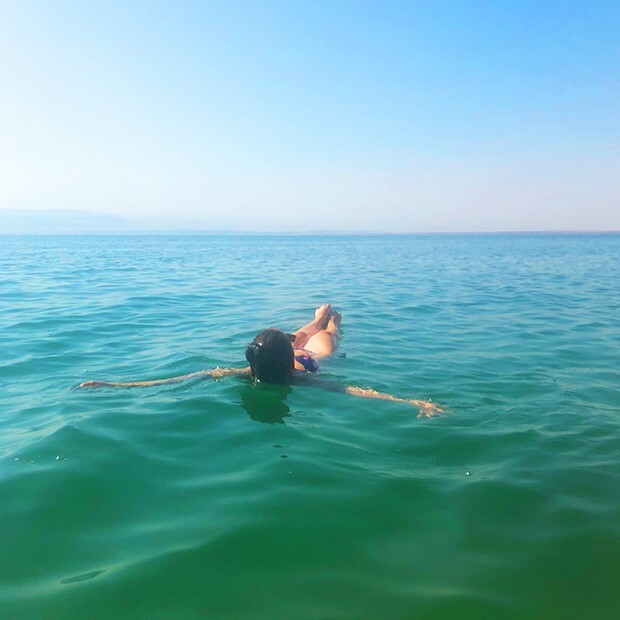 The lowest point on Earth and eight times saltier than any other sea, it is impossible not to float in the Dead Sea. 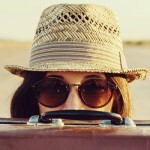 Beach signs instruct swimmers to protect their eyes and to not drink the ultra-saline water that has long been considered therapeutic otherwise. 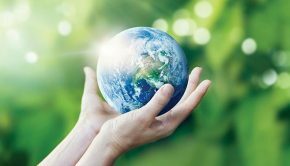 The sea’s mineral-infused water and thick dark mud are said to treat a variety of ailments from arthritis to psoriasis, and even the air in the region, rich in oxygen, is said to benefit those with asthma. 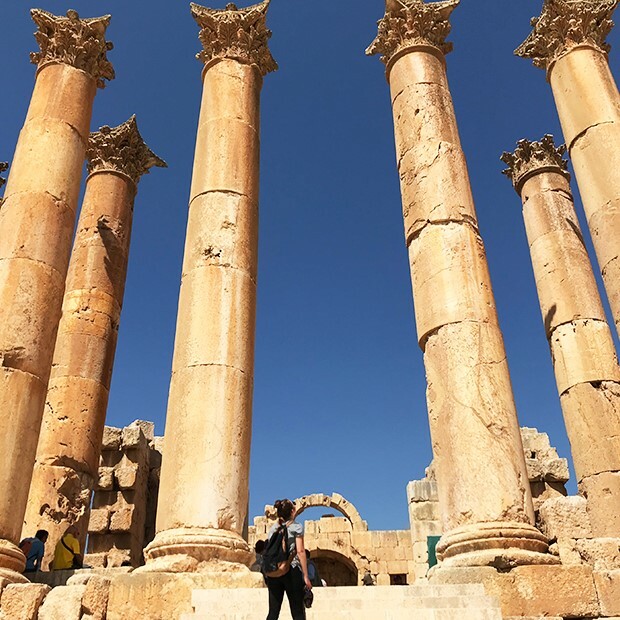 Jerash is Jordan’s second-most visited attraction after Petra, and rightfully so. 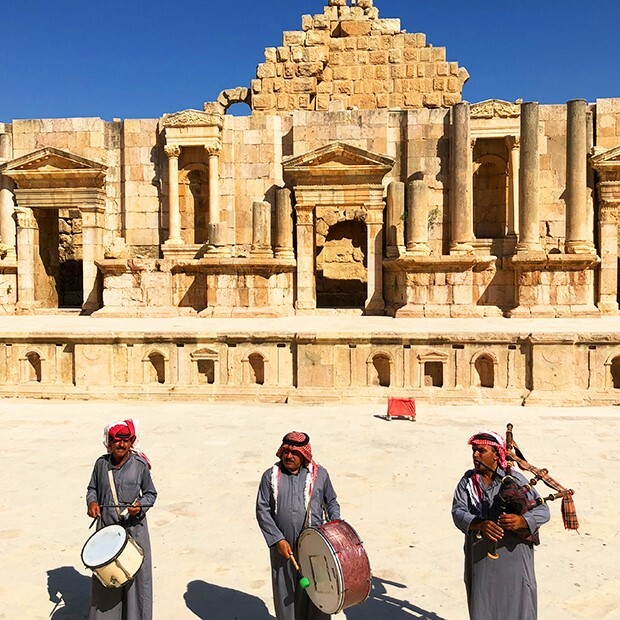 Buried under sand for hundreds of years, it has only been excavated and restored in the last century, bringing to life some of the best-kept Roman ruins in the entire Middle East. 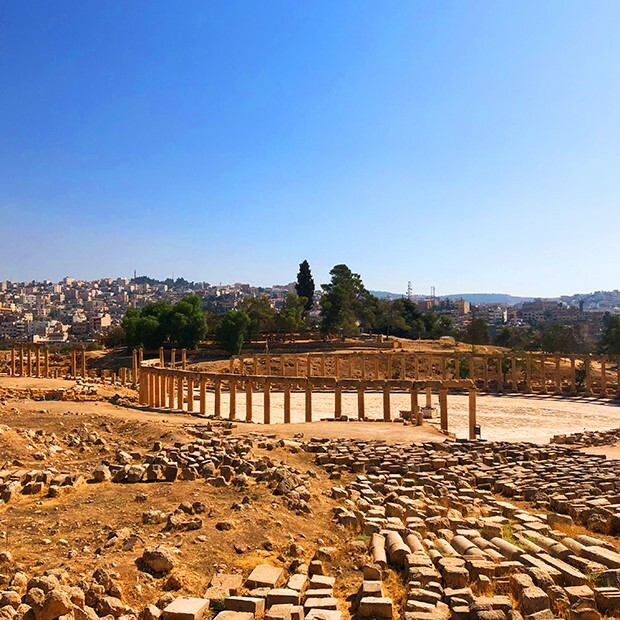 Ruled by the Greeks from around 330 BC, Jerash was overtaken by the Romans in 63 BC. 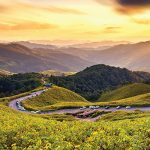 Today, the remains of both cultures are still evident in ancient roads, temples, theatres, gates, and more, with some structures dating back more than 2,000 years. The ruined city covers a vast area with little signage so it’s best to navigate it with a guide. At a leisurely pace, the main ruins take about 4 hours to cover and include Hadrian’s Arch, the Hippodrome and the Forum, along with the remains of the Temple of Zeus and the 5,000-spectator South Theatre. In the Old Testament, Mount Nebo was where Moses was granted a view of the Promised Land. It is also believed he was buried here. 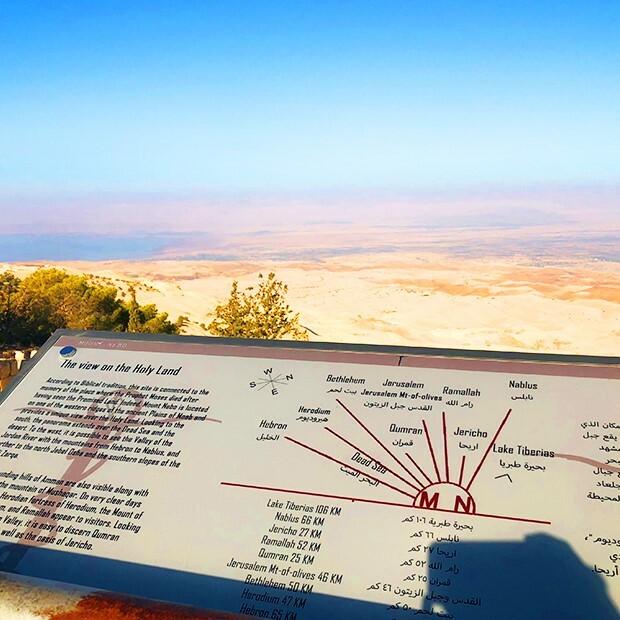 The panoramic views from the observatory at the peak of Mt Nebo stretch as far as the Holy Land, and on a clear day, you can see the Jordan River Valley, Jericho, Bethlehem, and the hills of Jerusalem, off in the distance. Enter through the Ottoman Gate and watch your head. Complete with low-ceiling doorways, the barracks, a church, prison cells, and yet to be excavated domestic residences, Karak Castle is one of the largest Crusader castles in the Levant. 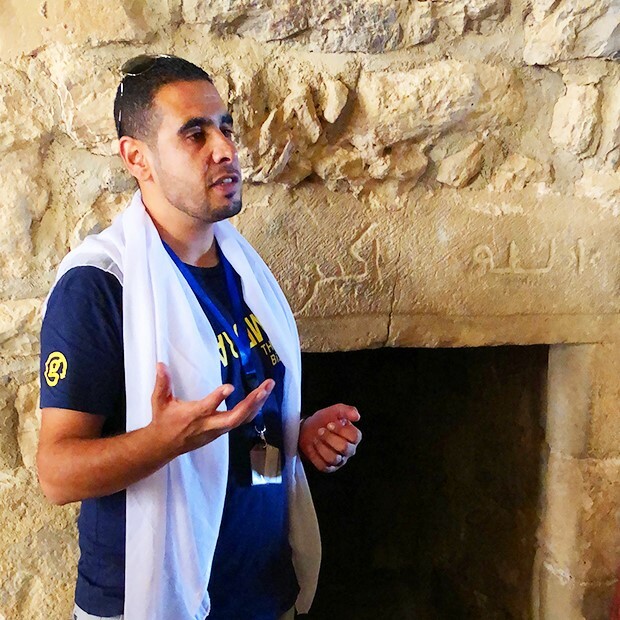 Built in the mid-1100s AD, Karak Castle is a relic from the Crusades in al-Karak, as explained by our guide, Zuhair. Marvel at the ancient walls of limestone and straw with prehistoric Byzantine rock inscriptions. Strategic towers offer views of Wadi Karak, thought to be the condemned twin cities of Sodom and Gomorrah. Bring a flashlight for the Greek inscriptions in the dark tunnels and watch your footing. Its excavation and reconstruction are ongoing. 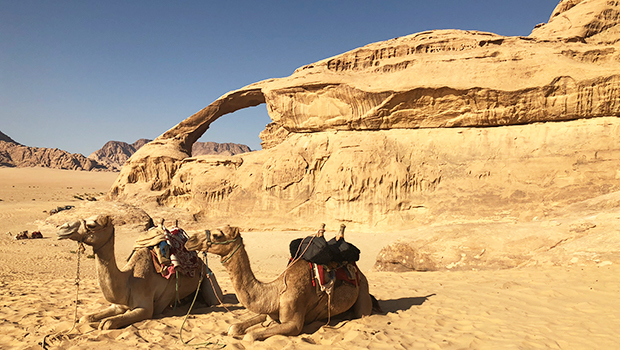 Also known as the Valley of the Moon, Wadi Rum is a spectacular protected wilderness in the south Jordan desert, with dramatic rock formations like the Burdah Rock Bridge. Its sandstone mountains contain caverns with ancient rock inscriptions and Lawrence’s Spring, a famous watering hole said to have been used by Lawrence of Arabia. 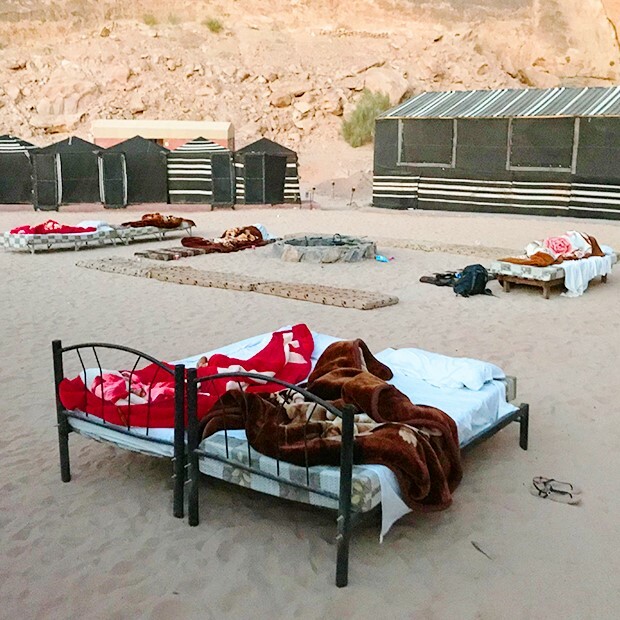 Morning, Wadi Rum style! The Bedouin camp we slept in under the stars, where photos couldn’t capture the breathtaking full moon shining like a spotlight as it moved through the sky. From our boat on the Red Sea, we saw Jordan, Saudi Arabia, Israel and Egypt all at once, as they all touch this important waterway. Snorkelling its coral reefs brought out lots of brightly coloured fish, too! 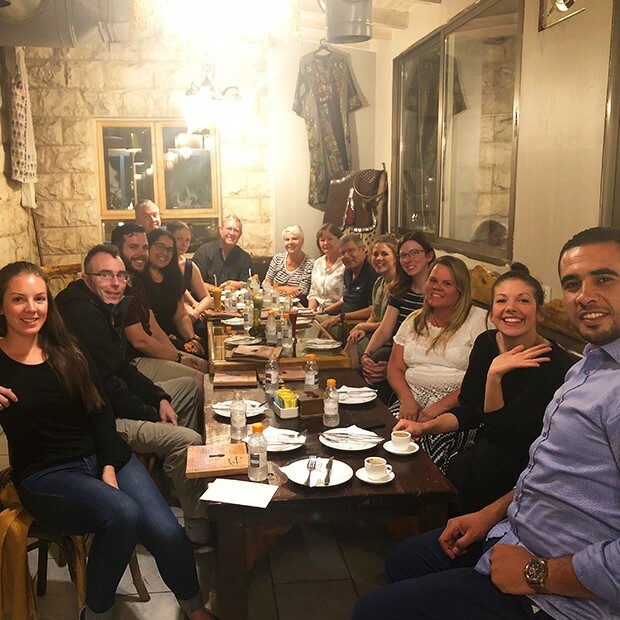 The capital, Amman, hosted our tour’s farewell dinner with our amazing tour guide, Zuhair. The food in Jordan is delicious, and if you’re vegan, very accommodating! Seeing Jordan without Zuhair’s guidance and insights would not have been the same. 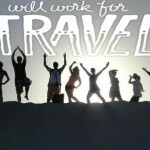 Ready to experience the Middle East for yourself? 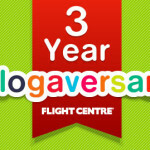 Book G Adventures‘ Highlights of Jordan tour or any one of their exciting worldwide adventures with Flight Centre. 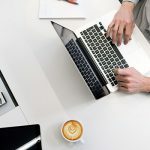 Chat us, call or visit us in-store today! 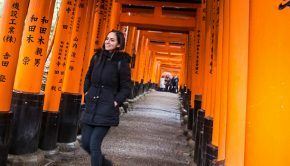 Alexandra Roper As Brand Marketing Manager for Flight Centre Canada, Alexandra has travelled the world, sharing her amazing experiences whenever possible. 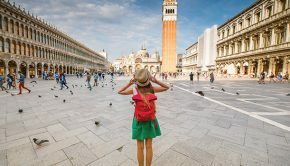 Armed with a sense of adventure, a natural curiosity, and a genuine love for animals, her interests shape her travels, and a good story is never far away. 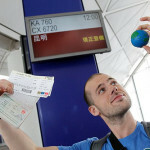 Alex is currently based in Vancouver, Canada.